When will happy days return for Chipotle? No one can say; all we know for sure is that it’s not yet. The burrito chain on Tuesday reported same-store sales fell a worse-than-expected 21.9% in the third quarter. Analysts were anticipating a drop of 18.7%. Profit fell 95% in the quarter. Still, the decline marks a recovery from prior months, including its steepest sales decline in January, when same-store sales fell 36.4%. 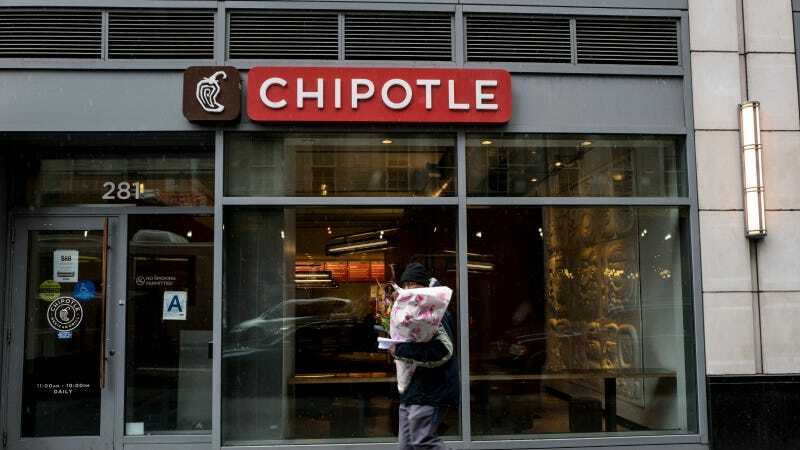 “While we’re on the road to recovery, we’re not satisfied,” Chipotle Co-Chief Executive Steve Ells told investors on Tuesday. Even when you can scrub away the stain, memories remain. Especially memories of food poisoning. Hence the frantic efforts by Chipotle to restore its previous sheen. For a while they relied upon giveaways, and they’ve also introduced a loyalty program. They told investors they’re looking at what they could add to the menu, such as dessert; AdWeek reports that they’re running experimental TV ads in Austin, Minneapolis, and San Diego, with an eye to potentially expanding the campaign. Please continue to remember Chipotle in your prayers during this tough time in Chipotle’s life.